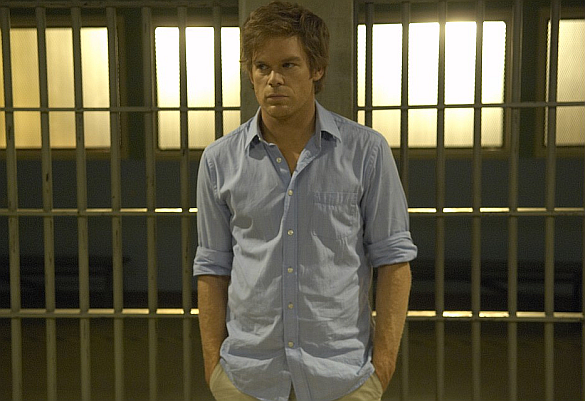 Ausiello: Is Dex taking his little vigilante operation behind bars? The show has put out a casting call for a “hardened yet thoughtful” prisoner who’s currently serving a life sentence for murder. Could be that it's a flashback (like in the book series) where Harry takes a younger Dexter to see a murderer serving life, to show what would happen if he got caught? Lol I'd forgot about that episode,thanks. But in the book series he actually talks to him and admires the killers body count and method, though thinks him stupid to have been caught. The killer also thinks it's interesting that Harry was doing what he was doing with Dexter. Where did you see that Deb HAD tuned him in? I haven't seen anything like that.